Menford assists Dorothy after she has tripped coming down the ship's gangplank. "Why don't you marry a nice rich girl?" Adams asks. Menford replies, "Why don't you find me one?" 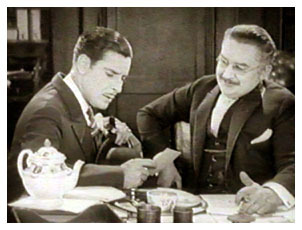 Adams then hands Menford a newspaper photo of Dorothy. Posing as his uncle, who is a doctor, Menford listens to Dorothy's heart. 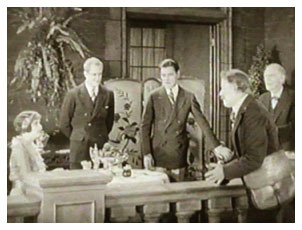 Although Menford has sold his home to Dorothy's father, he returns to his home late one evening after over-imbibing not realizing Dorothy is in his bed. Dorothy does not recognize him from the back and thinks an intruder has entered her room. In a "Lubitsch-style" bit of business. Dorothy falls on her knees beside the bed to sob after kicking Menford out. Her roaming hand happens to touch a shoe he left behind. Slowly she draws the shoe to her to caress. 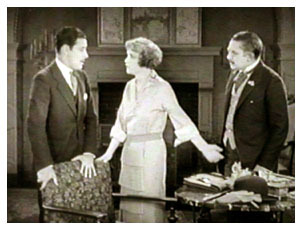 Menford tries to hide the fact that he and Dorothy spent the night in the same house together by lying and telling his friend they are married. Suddenly word spreads and everyone knows. When the mailman finds out, he announces, "I'll tell the happy news to the whole village!" "Dorothy, won't you please marry me in the morning?" "Why don't you throw this trickster out of the house?" After breaking off their marriage plans, Menford plans to leave for Paris. But, before he goes, he receives a letter from her saying she would like to say goodbye. Menford: "It was very kind of you to write this generous letter." Dorothy says she did not write the letter. 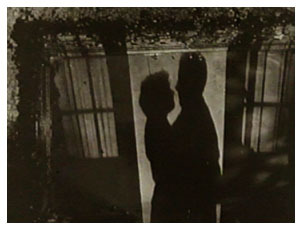 Two shadows embrace as the final scene fades.